We have lots of exciting events coming up at Curds and Wine this month and next! October has been declared American Cheese Month by the American Cheese Society, and we have some great ways to celebrate this month. See details for our events below! Celebrate American Cheese Month with your own homemade cheese! We'll help get you started at Curds and Wine with 10% off cheesemaking kits (including our Mozzarella and Ricotta Kit, and the Basic Hard cheese kit) and all cheese making books in the month of October. 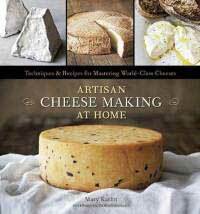 One great way to celebrate American Cheese Month: Mary Karlin, author of the recently released Artisan Cheesemaking at Home, will stop by Curds and Wine to sign copies of her new book after her cheesemaking class at Great News on October 1st. Drop off your copy to be signed before that date, or if you don't have her great new book yet, call or email us to reserve a signed copy. This book would make a great gift for the upcoming holidays to inspire your cheese-loving friends to try their hand at making their own cheese! Local cheesemakers have formed an official cheesemaking club, Queso Diego. Sign up for the forum and join us at meetings every 3rd Tuesday of the month -- details for the meeting location will be sent out to members of the forum. You can also "like" the club's Facebook page to see all of our fun activities! 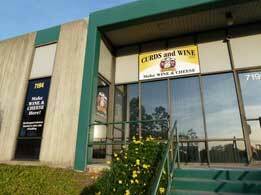 The October meeting will be held at Curds and Wine on Tuesday October 18th at 6:30 pm. Our presentation for the evening will be "Blue Cheese" by member John McKay. We hope to see you there! Join us at Curds and Wine to learn how easy and rewarding it is to make your own cheeses at home! At this class you will learn t he fundamental processes behind fresh cheesemaking as well as the techniques for making pressed cheeses and aged cheeses such as cheddar, gouda, and camembert. We will make fromage blanc, ricotta, and queso fresco, and demonstrate the processes involved in making feta, swiss-style cheeses and mold-ripened cheeses such as camembert/brie-style and blue cheeses. We will have samples of the various styles of cheeses you can make at home from Venissimo, as well as other refreshments. Finally, you will receive a packet with a recipe booklet to make the cheeses from the class as well as basic supplies to get you started with your cheesemaking. You will also receive a 10% discount on any purchase in the shop following the class. 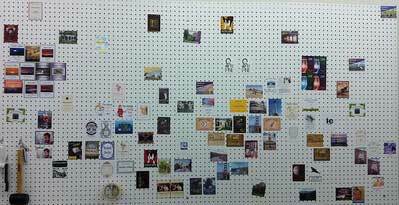 The fee for this class is $50 per person, and class size is limited to 12 participants. 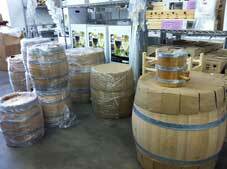 We have a selection of new Hungarian Oak barrels now in stock at Curds and Wine! One of our favorites is the 1-gallon vinegar barrel, but we have several sizes of barrels and stands available for aging your wine or beer at home as well. These barrels are made from the best quality oak of the world grown on the steep rocky hillside of Zemplen forest of Hungary. The Zemplen Forest has the same oak species as the Quercus Petrea /Sessile which is the tight grained oak of Nevers and Allier of France. Because of the unique mineral content of this soil, the barrels from this oak create ultra premium and luxury wine taste. Staves are air dried for three years, barrels have a medium toast. See our webpage for pricing information, and contact us to check availability. In association with San Diego Amateur Winemakers' Society, Curds and Wine will be hosting bi-monthly home winemakers' seminars. These seminars are held every even numbered month on the third Saturday at 1 pm. Seminars for 2011 will be led by Lum Eisenman, a winemaking guru that we are lucky to have in the San Diego area. Lum will share his expertise on various winemaking techniques and issues. This month Lum will discuss "Wine Measurements." These seminars are free, but limited to 20 people. If you are interested in participating, please RSVP here. We have a few wine kits that are approaching the end of their optimal shelf life. These are exceptional kits, but should be made soon. We are offering the kits listed below for a 15% discount, available on in-stock items only. If you are interested in any of these kits, please contact us or come in today to take advantage of these great prices. CHILEAN MALBEC-SHIRAZ WITH GRAPE SKINS (Selection International Ultra Premium 8-10 week kit; requires >2 years bottle aging for best results) Displays a balance between ripeness and power, with intensely rich Shiraz grapes for a bold ruby purple color, deep dark plum and blackberry aromas showing subtle accents of chocolate. Malbec brings plum, blackcurrant and voilet aromas leading to a slight touch of leather notes. Serve with roasted meats, rich stews, or try it with bittersweet chocolate. AUSTRALIAN PETIT VERDOT WITH GRAPE SKINS (Selection International Ultra Premium 8-10 week kit; requires >2 years bottle aging for best results) A dark, rich wine with wonderfully concentrated flavors of juicy blackberry and blackcurrant with smooth, gripping tannins and an elegant structure leading to a magnificent, boldly oaked finish. Serve with grilled steak, roasted lamb or bittersweet chocolate! SPANISH TEMPRANILLO WITH GRAPE SKINS (Selection International Ultra Premium 8-10 week kit; requires >2 years bottle aging for best results) Shows the black cherry, raspberry, plum and tobacco notes of the varietal, but tends towards lushness and an overflowing of soft, ripe tannins rather than bright fruit. Vanilla and spice notes in the oak give way to a beguiling hint of dark coffee on the finish. Serve with tapas, like grilled chorizo, rich tomato dishes like Moussaka or even grilled sardines. 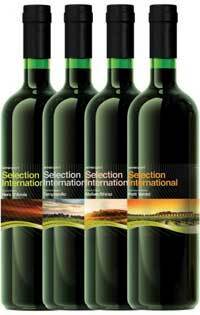 SICILIAN NERO D'AVOLA WITH GRAPE SKINS (Selection International Ultra Premium 8-10 week kit; requires >2 years bottle aging for best results) Deep garnet, shows ripe, berrylike fruit aromas lent complexity by hints of toast and smoke. Flavors of fresh blackberries, dark chocolate and anise. A great wine for hard cheeses, rare red meats and stews. Each kit is $159.95, get yours today at Curds and Wine! 2011 Limited Editions -- Coming Soon! Winexpert will announce their 2011 Limited Edition kit releases the first week of October, three reds and two whites. We will send out a supplementary email announcing these outstanding kits for preorder, for in-store pick up only. Be sure to put in your order before the deadline, these kits always sell out. Limited Edition kits are premium kits specially selected from the best grapes of the year's harvest. This year one of our customers won Best of Show at the San Diego County Fair with a Limited Edition wine kit -- the first wine he ever made! Our One Year Anniversary is approaching! Curds and Wine is almost one year old! We opened November 11, 2010. We will have many festivities planned to mark the occasion, to be announced in our November newsletter. Part of our celebrations will be to vote on your favorite wine label on the Big Board. Come in any time to cast your vote, one vote per customer please! Votes can be cast between now and Sunday November 6th, so we can tally up the votes to announce the winner on our anniversary. We will have some special prizes for the winner and the runner-up, to be announced on our Facebook page and in the December newsletter. Good luck to everyone!